Three-dimensional floral decoration is used to great effect on this evening or ball dress of about 1815. The dress is made of machine-made white silk bobbin net which provides a delicate foil for the contrasting textures and colours of the rich embroidery which decorates the hem of a deep flounce stitched to the skirt. The flounce is headed and finished at the hem with blue silk satin; petal-shaped pieces of net, also bound with satin, fall from the heading. The same mid-blue satin and a darker blue satin are used to create roses and rose buds which are arranged with other flower heads, made of pale blue crêpe, along the hem of the flounce. The details of the flowers, and their stems, leaves and tendrils are embroidered in chenille and silk. The bodice is similarly decorated with narrow bands of the mid-blue satin and its sleeves are embellished with the embroidered crepe flower heads. 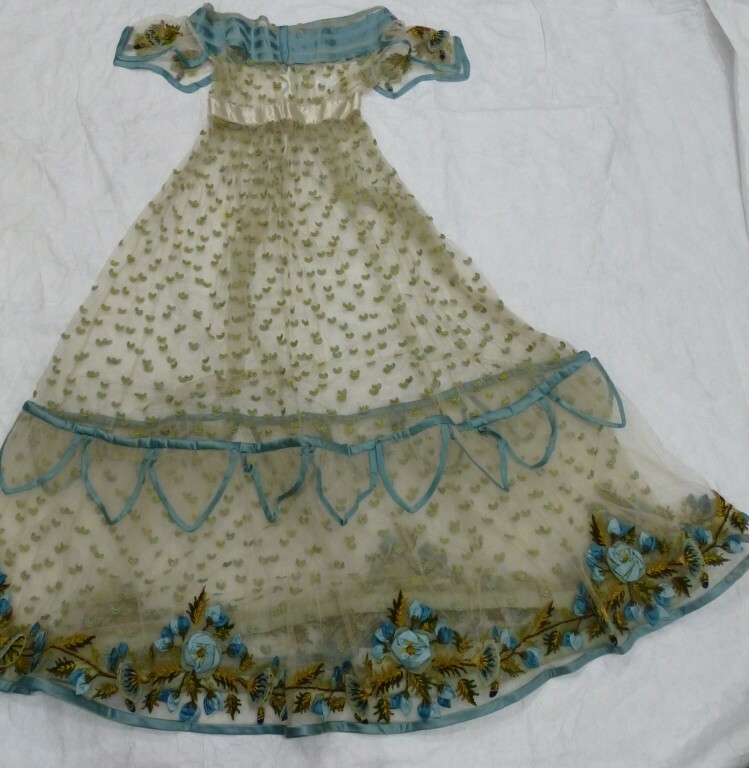 The silhouette of the dress, its materials, and its lavish but delicate three-dimensional embroidery were the height of fashion at this period. 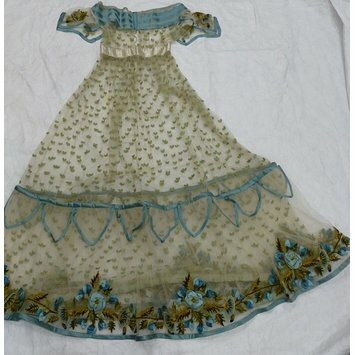 Evening or ball dress of machine-made white silk bobbin net decorated with hand-embroidery, and blue silk satin trim. The dress has short, shaped sleeves, a low neck-line, high-waist and bell-shaped skirt. The ground fabric is decorated all over with small applied motifs made of crescent shapes, possibly made of card, wrapped in blue silk with their centres filled with yellow silk worked in satin stitch. The lower skirt is trimmed with a flounce of net headed and finished at the hem with blue satin trim. Petal-shaped pieces of net edged in the same satin are stitched to the upper band. A sleeve and the flounce are richly decorated with three dimensional flowers created from two shade of blue silk satin and embroidered crêpe. The embroidery is executed in silk chenille in shades of brown, yellow and blue and in yellow silk. The dress is hand-sewn. The dress closes down he centre back with a tie at the top of the neck and 3 hooks and eyes, one at the neck and two at the waist. Evening dress of machine net and silk satin, Great Britain, c.1820. Johnston, Lucy with Kite, Marion and Persson, Helen. Nineteenth-Century Fashion in Detail. London: V&A Publications, 2005. 190-1p., ill. ISBN 185174394.